HERNANDEZ RIVERA Yonny Jose strikes out looking. 1 out. RODRIGUEZ SUBERO Jorma Jesus flies out to left field. F7. 2 out. 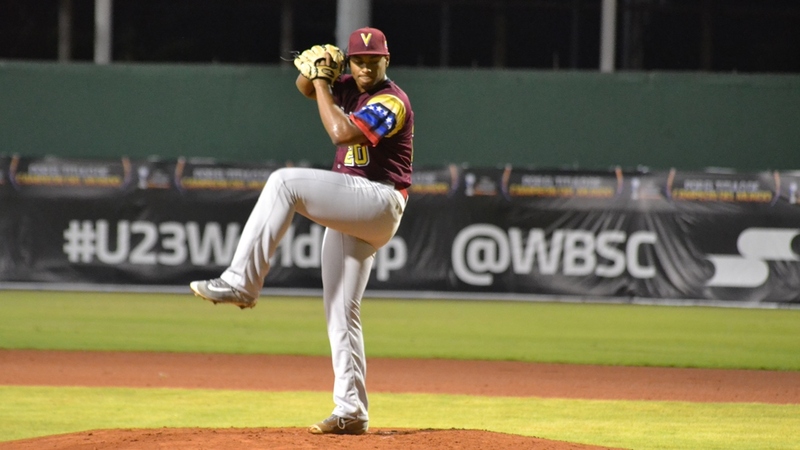 CEDEÑO MENDOZA Leandro Arturo strikes out swinging. 3 out. RIVERA VIDAL Kevin David strikes out swinging. 2 out. RIVERA PEREZ Emmanuel M grounds out. 5-3. 3 out. Ball 1. CONCEPCION HERNANDEZ out at 1st PO13. 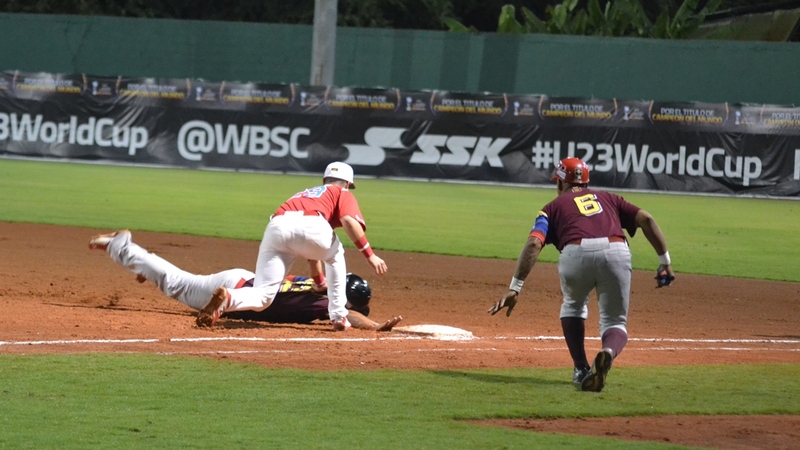 YEPEZ ALVAREZ Juan David flies out foul. FF3. 2 out. DIAZ ARTEAGA Joel Samuel flies out down right field line foul. FF9. 3 out. BURGOS CENTENO Aldemar strikes out swinging. 1 out. MIRANDA PALACIOS Jose Francisco strikes out swinging. 2 out. MARRERO TORIBIO Lean Carlos singles. MACHADO ACOSTA Carlos Daniel strikes out swinging. 1 out. ROMERO ROJAS Yoel Omar flies out to center field. F8. 2 out. LUJANO PACHECO Jesus Daniel grounds out. 6-3. 3 out. PANTOJA DIAZ Alexis Xavier singles. GONZALEZ CORTES to 2nd. DIAZ Isan Xavier strikes out looking. 1 out. RIVERA VIDAL Kevin David reaches on error. E-5. GONZALEZ CORTES scores. PANTOJA DIAZ to 2nd. RIVERA PEREZ Emmanuel M flies out to right field. F9. PANTOJA DIAZ to 3rd. 2 out. BURGOS CENTENO Aldemar grounds out. 1-3. 3 out. RODRIGUEZ SUBERO Jorma Jesus flies out foul. Bunt. FF2. 1 out. CEDEÑO MENDOZA Leandro Arturo reaches on fielders choice. HERNANDEZ RIVERA to 2nd on E4. CONCEPCION HERNANDEZ Anthony Jose walks. HERNANDEZ RIVERA to 3rd. CEDEÑO MENDOZA to 2nd. YEPEZ ALVAREZ Juan David flies out to deep right field. F9. HERNANDEZ RIVERA out at home 92. 3 out. MIRANDA PALACIOS Jose Francisco singles through the right side. MARRERO TORIBIO Lean Carlos strikes out looking. 1 out. HERNANDEZ MARTINEZ Jan Alexis doubles to deep center field. MIRANDA PALACIOS to 3rd. PANTOJA DIAZ Alexis Xavier flies out. L6. 3 out. MACHADO ACOSTA Carlos Daniel reaches on error. Bunt. E-2. Sacrifice. ALVAREZ ALBORNOZ to 2nd. ALVAREZ ALBORNOZ to 3rd on E2. MACHADO ACOSTA to 2nd on E2. ROMERO ROJAS Yoel Omar singles to center field. ALVAREZ ALBORNOZ scores. MACHADO ACOSTA scores. 2 RBI. LUJANO PACHECO Jesus Daniel grounds out. Bunt. 1-3. Sacrifice. ROMERO ROJAS to 2nd. 1 out. HERNANDEZ RIVERA Yonny Jose grounds out. 5-3. 2 out. RODRIGUEZ SUBERO Jorma Jesus grounds out. 6-3. 3 out. DIAZ Isan Xavier grounds out. 4-3. 1 out. RIVERA PEREZ Emmanuel M singles. BURGOS CENTENO Aldemar walks. RIVERA PEREZ to 2nd. MIRANDA PALACIOS Jose Francisco grounds out. 6-3. 3 out. 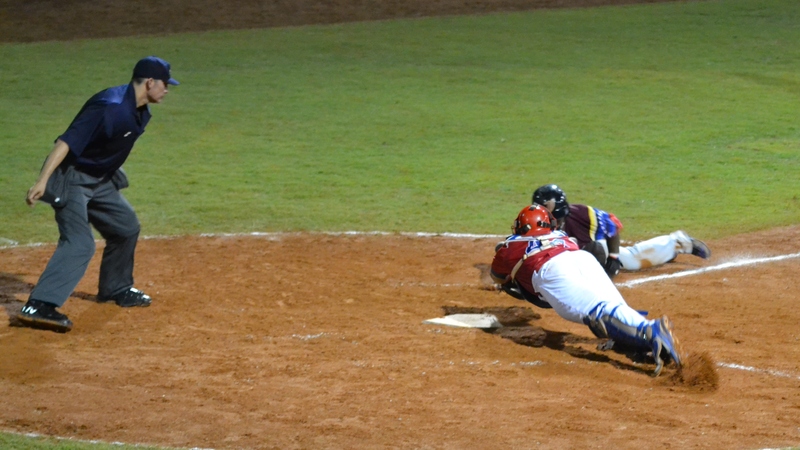 CEDEÑO MENDOZA Leandro Arturo flies out to right center. F8. 1 out. CONCEPCION HERNANDEZ Anthony Jose homers to deep left field. 1 RBI. YEPEZ ALVAREZ Juan David singles. ALVAREZ ALBORNOZ Joscar Jose grounds out. Bunt. 1-3. Sacrifice. YEPEZ ALVAREZ to 2nd. 2 out. PEREZ RODRIGUEZ Georvic Jose is intentionally walked. ROMERO ROJAS Yoel Omar walks. YEPEZ ALVAREZ to 3rd. PEREZ RODRIGUEZ to 2nd. LUJANO PACHECO Jesus Daniel flies out foul. FF5. 3 out. MARRERO TORIBIO Lean Carlos grounds out. 3U. 1 out. HERNANDEZ MARTINEZ Jan Alexis grounds out. 5-3. 2 out. HERNANDEZ RIVERA Hit By Pitch. RODRIGUEZ SUBERO Jorma Jesus reaches on error. E-5. HERNANDEZ RIVERA to 2nd. CEDEÑO MENDOZA Leandro Arturo walks. HERNANDEZ RIVERA to 3rd. RODRIGUEZ SUBERO to 2nd. CONCEPCION HERNANDEZ Anthony Jose reaches on fielders choice. HERNANDEZ RIVERA scores. CEDEÑO MENDOZA out at 2nd 564. 1 RBI. YEPEZ ALVAREZ Juan David singles to left field. RODRIGUEZ SUBERO scores. CONCEPCION HERNANDEZ to 2nd. 1 RBI. ALVAREZ ALBORNOZ Joscar Jose reaches on fielders choice. CONCEPCION HERNANDEZ to 3rd. CONCEPCION HERNANDEZ scores on E4. YEPEZ ALVAREZ out at 2nd 54. PEREZ RODRIGUEZ Georvic Jose flies out to left field. F7. 3 out. PANTOJA DIAZ Alexis Xavier walks. 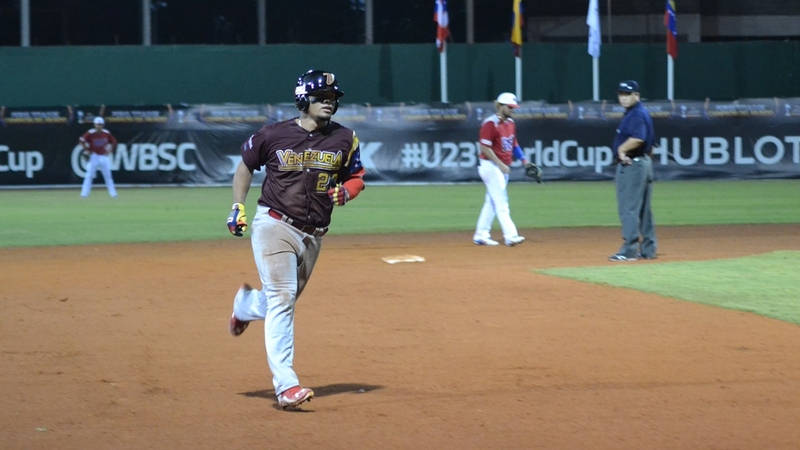 DIAZ Isan Xavier reaches on fielders choice. PANTOJA DIAZ out at 2nd 46. RIVERA VIDAL Kevin David grounds out. 5-3. DIAZ to 2nd. 2 out. RIVERA PEREZ Emmanuel M singles up the middle. DIAZ scores. 1 RBI. BURGOS CENTENO Aldemar strikes out swinging. 3 out. ROMERO ROJAS Yoel Omar flies out to left field. F7. 1 out. JIMENEZ CRUXENT doubles to deep left field. HERNANDEZ RIVERA Yonny Jose grounds out. 1-4-3. JIMENEZ CRUXENT to 3rd. 2 out. RODRIGUEZ SUBERO Jorma Jesus reaches on error. E-6. JIMENEZ CRUXENT scores. MIRANDA PALACIOS Jose Francisco flies out. F6. 1 out. MARRERO TORIBIO Lean Carlos grounds out. 4-3. 2 out. HERNANDEZ MARTINEZ Hit By Pitch. FERNANDEZ CRUZ Xavier Antonio reaches on fielders choice. HERNANDEZ MARTINEZ out at 2nd 54. CONCEPCION HERNANDEZ Anthony Jose flies out to deep left field. F7. 1 out. YEPEZ ALVAREZ Juan David grounds out. 6-3. 2 out. CANCEL DIAZ Gabriel Octavio flies out foul. FF3. 1 out. DIAZ Isan Xavier reaches on error. E-3. RIVERA PEREZ Emmanuel M grounds out. 4-3. 3 out.